Over the past ten to fifteen years organizations have noticed a shift in the work habits of employees especially with the wide availability of mobile capabilities. Employees now work from home unless they need to collaborate with other coworkers and organizations must accommodate the variety of work styles for each one of their employees. 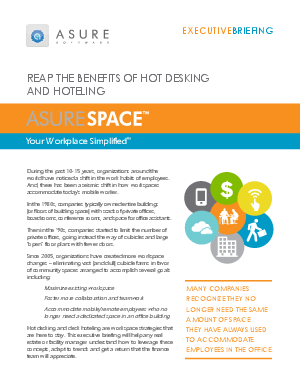 Download this whitepaper to learn how “hot desking” and “desk hoteling” are the best ways to accommodate employees in and out of the office and see how doing so can increase collaboration and productivity.